Sword of Ages variants now on sale at Spy Monkey Creations! 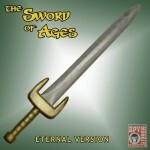 With my blessing, Spy Monkey Creations is now selling the original Sword of Ages, along with three brand-new variants. Thanks for the heads up Poe. Just picked up the Emerald Blade and Cold Steel versions. I hope for a future release they give us a version that'd suit Webstor. I think the Demon King blade would be a bit too much for him but the Sword of Ages would look spot on. Maybe an orange hilt like the Guardsmen sword but with a dark metallic navy colored blade. It'd possibly look good in Whiplash's hand too. Yeah, thanks a bunch for the link. I really wanted one of these for my King Hssss figure, & exactly in the Eternal blade-type colour scheme. He'll look so much more menacing pointing an undead Megator into action. Picked up a Cold Steel Version for my Keldor. Glad you posted this, I didnt even have a clue. Poe, is the Eternal version like your exclusive?? I'm starting to kick myself for not getting the Eternal one because from the pic it looks as if the hilt is a true gold versus the yellowish gold that your exclusive had. 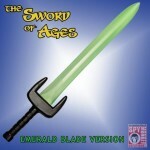 Just ordered the Emerald Blade version. While I definitely like the idea of using this with King Hssss, I think it might also go well with Scareglow or the Faceless One. You know, I didn't even think about Trap-Jaw, although I don't seem him as much of a sword guy. You are correct, however, that the colors match perfectly. Trap-Jaw/Kronis has a ton of accessories, though, doesn't he? His arm attachments, the Roboto attachments in black, the blue Man at Arms dagger and pistol (weren't those supposed to go to Kronis? ), the Spy Monkey space pirate gear, and the black and purple shield and rifle. What figures do you suppose some of the other blades would go best with? 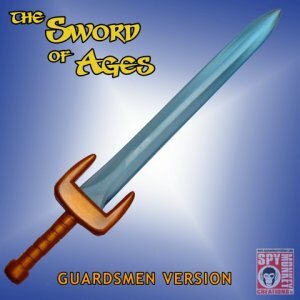 The Guardsmen is obviously for the Palace Guards or Man-At-Arms and the Eternal Version definitely seems tailor made for Randor, Marlena, and other members of the Eternian Royal family (could work for Optikk, too). Who might Cold Steel be intended for? Wundar, perhaps?